Robots sweep Amazon’s warehouses in the US, stacking, sorting and shipping all sorts of products and, unknowingly, automating away jobs, incomes and humans through their uniquely ordained AI processes laser-focused on delivery. 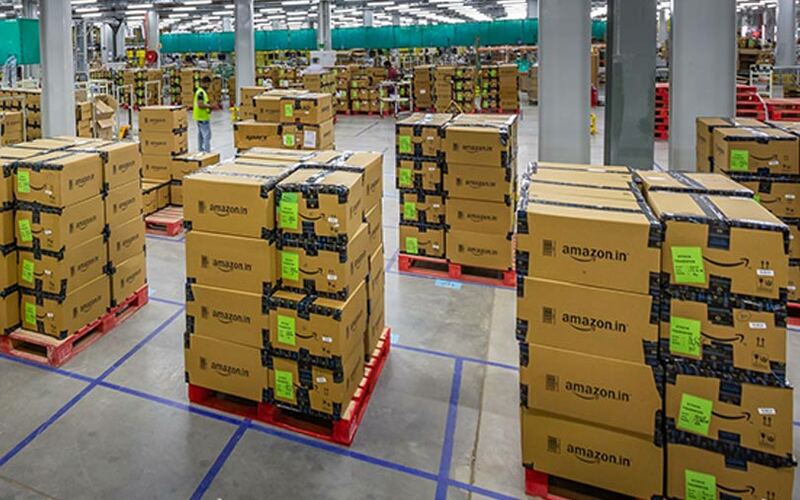 But inside Amazon’s 50th warehouse in India, opened earlier this month, where sorting through stuff is the primary task, the robot invasion looks far, far away — as armies of humans still do most of the work, although teamed up with handheld devices. The warehouse, 30 kilometres south of central Bengaluru, and strategically launched just ahead of the festive sales season, is the e-commerce giant’s fourth such in the city. Spread across 3.5 million square feet, it is only a wee bit smaller than the largest one in India at Hyderabad, sprawling 4 million sq ft. The barely-automated facility, where nearly every task is performed by a human, can ship more than 2,000 orders an hour. In a unique example of the unit’s decidedly manual ways, an Amazon employee purposefully walks down a long narrow aisle burdened with a large cart carrying all kinds of products, scans it and stows it on the shelf. At the same time, another employee swishes by the same aisle, scans a shelf and draws an instant beep from her handheld, in a helpful electronic nod to the place she has been looking for all along. Had she scanned the wrong shelf, multiple beeps would have rang out of the device. Further on, sorting through stuff, the handheld alerts her on what to pick and what to not, and the employee, having scanned up each item, fills up her cart to the very brim, like an overzealous deals-mad Christmas shopper who has lost all track of her credit balance. Amazon helpfully calls this "picking density", that is, cramming up as many products as possible into the warehouse just because the land prices in India are way too steep. At the end of the aisle, a conveyor belt carries small boxes, some of these meant for the shipment of a single product, others for multiple products. The employees work the conveyor belt 20 hours a day, in shifts, assigning products from their carts to the relevant boxes, which are then whisked away to the packaging section. Throughout all this, the most notable piece of tech -- the barcodes -- help the scanners, computers, and software to bring merciful method to the warehouse madness. Add to the techno-list the various sensors the warehouse employs, which dutifully switch off the lights after you in any section. And yes, the centre harnesses solar power for most of its electricity needs. In the packaging section, where products are weighed up, any deviation from the designated weight thwarts generation of the address label, meaning no shipment till clarification. Moving past the packaging, the loading and unloading processes of the warehouse vary in line with the truck size, a sharp contrast to the US, where the invariable size of the truck necessitate no such modifications. "In the US, all trucks are of uniform dimensions, whereas in India it could be a mini lorry or a large truck and the truck body builders are different. So for the same make of the truck, you can have different body dimensions," said Akhil Saxena, vice-president for customer fulfilment at Amazon India. To load or unload, each truck is allotted a watertight time slot, flashed on a display board. This means the vehicles roll in and out on time, sometimes without shipments that failed to make it. Increasingly, Amazon is working towards shipping products in the original manufacturer's box to reduce the use of plastic cover and cardboard. "We call this Ship In Own Container. We make sure that the product is safe to be shipped and will not be damaged in transit. If we cannot ensure that, we make sure that we do our own packaging," said Saxena. Amazon would not discuss the amount of investment that has gone into building these warehouses or the employment they generate. However, the company said that, at full capacity, the warehouse could employ 2,000 people across two shifts. "The warehouses in the US are much bigger and the automated processes are often faster. Also, it is about the arbitrage of fixed costs to variable costs. In India, labour is still cheaper," Saxena said, adding that robotic warehouses are still a few years away.